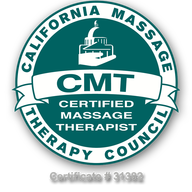 ​It makes me a little nervous to think about getting a massage where I'm supposed to talk about my feelings. I'm one of those people whose idea of introspection is pretty much limited to thinking about what I want for dinner -but I decided it can't hurt to give something called Rosen Method Bodywork a try. After all, the 88-year-old founder of this method of mind-body connection is coming to Santa Cruz to speak about her work. People say she is an amazing woman who worked with associates of Carl Jung in the field of relaxation and breath awareness back in the 1930s. And While her bodywork method does not have the name recognition of something like rolfing or reike, it has practitioners around the world. So I head over to the simple Santa Cruz office of Bill Samsel, who was one of the first people Rosen trained in this work. As I find out, there is something nice about that idea of introspection. Samsel is a quiet man who seems as calm as a windless sea. He sits in his office decorated with photos he has taken over the years and explains how Rosen began working on breath awareness and relaxation techniques with psychiatric patients in Germany. Then World War II came along, and the young Rosen, who is Jewish, emigrated to the United States. She did physical therapy work at first, for years. But in the 70s, Rosen began developing her bodywork technique in earnest. The idea behind Rosen Bodywork is for the practitioner to touch both body and mind. "We touch that area where there is chronic tension not in a manipulative way," Samsel says, "but more to be present with that person at the place where chronic tension simply will not go away." Then, as relaxation happens, unconscious feelings and memories may rise to the surface, so there is also dialogue, according to Samsel. Through the process, old tensions and patterns may move away, allowing the client to feel more alive or to make new choices in life, Samsel says. To explain, Samsel tells the story of a woman who came to him with upper back pain that would not go away. During their sessions, the patient told him she had dreamed as a child of being a concert-level pianist, but that the dream had faded away. She went through a number of bodywork sessions, then one day she spotted Samsel in the grocery store. She rushed up to tell him that she had begun to play the piano again. And, the pain in her back had gone away. "It's process-oriented," Samsel says. "It's not a fix-it kind of work." But lots of times, the awareness seems to make muscle pain and tension a thing of the past. His job, Samsel says "is to use words to reflect what I feel or see with my hands and to be present with the person as they become more aware of the fact that, yes, the holding (of the muscle) is really there." This method of bodywork is not for people who are emotionally fragile, Samsel says, but for people who feel blocked, who want to feel more alive. The number of sessions is determined solely by the client, Samsel says. I feel a little nervous when I lie on the comfortable massage table in Samsel's office. I'm not sure what kind of things I'm supposed to talk about. There's a muscle in my back that hurts like heck, but I think it's from having to reach across my desk to answer the phone all the time - not from an emotional thing. Samsel tells me I could be right. Or, he says softly, it could be that every time the phone rings I know it means more work. It may not be the way I reach for the phone, he says, but rather what reaching for the phone means that makes my muscle hurt. I'd never thought of it that way. Like I said, my idea of introspection is suddenly realizing my shoes hurt. I lie on the table, and Samsel's fingers touch my back, my knees, my hips. There's a blockage he feels around my hips. Maybe from feeling too busy all the time, he says. I wonder how he knows that, but I don't say much. His gentle touch feels good, relaxing. I sigh. He says that's good. His fingers push lightly on the exact sore spot in my back and, after awhile, I find myself telling him that he's right about the busyness. I feel like I always have too many things to do, I say. I wish I could see all my chores as a joy, not a burden -like this woman I met once, I tell him. He tells me quietly to think of the things that bring me joy while he then puts one hand on the sore spot and the other on my shoulder, where my heart is. I don't know if it's the pressure of his hands, but I feel myself relaxing as I think about the things in my life that make me happy: my son, my husband, a great book, swimming in a warm ocean, a long run in the park. I lie there for about 10 minutes thinking about the things I like and, boy, does it feel good. I start to relax and feel the stiffness in my back ease a little. It doesn't go away. It just feels a little better. Samsel says I don't have to do anything about the chores or the busy feeling, and I like that. It's enough that I was there, he says. When I get back to the office, the phone still rings and deadline still looms. But about halfway through the afternoon, I stop for a minute and think again about all those things that bring me joy. I catch myself thinking about quitting a committee I volunteered to be on. It's weird, but some of the things Samsel said have made me think. I don't quit the committee, but I think maybe I should get rid of a few of the duties in my life, the ones I don't really want to do. I think a few minutes more. I also decide to have spaghetti for dinner.